AAA: Can you tell us about your experience with performance art? Is it true that you started to get involved with the medium in the 1990s? 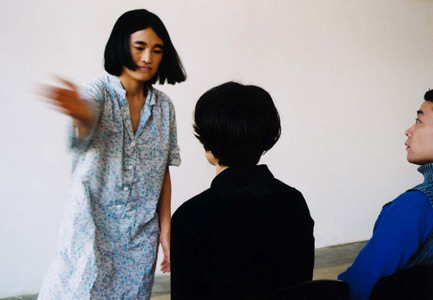 Duan Yingmei (DYM):The time I spent in the East Village in Beijing in the 1990’s prompted me to ask the question: what is performance art? Though I participated in some collaborative performance works, I was not doing much performance. Most of time I painted. 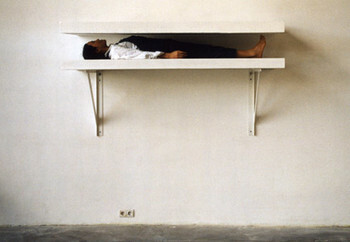 The question only found its answer in 2000, as I was studying with Marina Abramovic in Braunschweig, Germany. Since then, I have concentrated mainly on performance art and have developed many experimental performance works in both public and private space, as well as other longer period performance projects. AAA: In some of your performances, particularly those centred on issues of identity, you focus on the role of women in social interactions. Is the female perspective central to your work? DYM: I think of myself as a woman in particular in only a few of my performances. Most of the time, I consider myself to be a normal human being, generally interested in how one can express one’s feelings. I haven’t researched the changing social role of women in China in the last 15 years; and I haven’t considered that change to be significant in my work. But it is a very interesting question, and one that I would like very much to pay attention to moving forward. AAA: Collaborations have played a crucial role in many of your works, ever since your first acclaimed performance, to add one meter to an anonymous mountain. Can you give one example/ story illustrating how you solve problems with collaborators? What kind of issues have you run into and how have you resolved them? DYM: I collaborate with a lot of people, not only artists, but also people with non-art backgrounds. Collaboration always inspires me to think of new ideas and discover new things. But, collaborating with others can be challenging and has its own problems…which is to be expected. One learns how to solve problems, how to communicate, and how to be generous. I prefer collaborations where all those involved begin from the same level. They do not work for me, and I do not work for them; we are equal partners. I have done many beautiful collaborative performances with this philosophy. For example, in 2008, during a three-month residency at the Chinese Arts Centre in Manchester, I researched the art system and society and developed nine collaborative performances with different people. One of these performances involved working with an artist named Anthony. 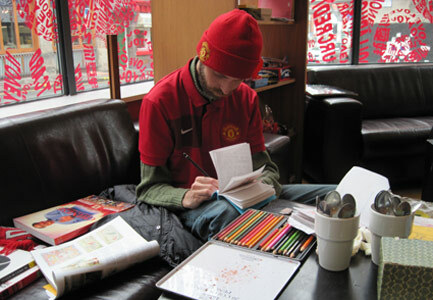 Anthony is autistic and speaks very little, but he spends extensive amounts of time drawing in different museums and galleries in Manchester. When I met him, I became interested in his drawings and his life. I tried to open the door of my residency studio to communication with him. My English is not very good, and his English was difficult for me to understand, so initially, it was difficult for us to communicate. One day, I tried a different approach to communicate with him, asking him to write down what he was trying to say. He said that he could not really write properly, but his writing was so beautiful to me. After a few days, I discovered his broad knowledge about the history of art in England. After that, our connection was made through a written conversation about England’s art history. With time, I also found that Anthony had a great interest in doing performance, so we began to find something to work on together. After working together closely during the three months of my residency, we did a very successful collaborative performance. I was very surprised by how much Anthony changed during the performance. He spoke very clear and articulate English, communicating with the audience and explaining a show of his drawings in my studio. Collaboration with other artists has been the most difficult for me. I worked with a group of performance artists in 2009 and I found it difficult to get conversations started about how we could work productively together. AAA: Yingmei in Bluebell Wood Children’s Hospice (2010) seems different from some of your previous works. You were almost like a social worker, trying to develop relationships with children, their families, and the hospice staff by simply caring about them and talking to them. How does this experience make you reflect on your role as an artist? DYM: Performance art should not be bound to galleries, museums, and festivals; it can also happen in daily life. I am a performance artist and, at the same time, a researcher. Using my performances to connect with different parts of society has become a very important part of my work. I am always interested in doing social projects. 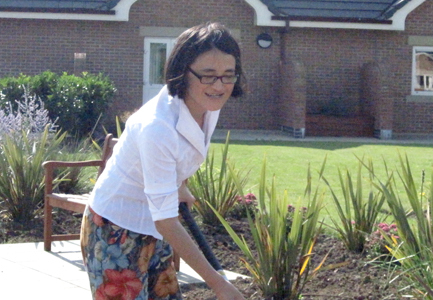 In Yingmei at Bluebell Wood Children’s Hospice, I worked both as an artist and a volunteer. Bluebell Wood Children’s Hospice is a fascinating institution, offering a place for children with terminal conditions and their families to come to relax and have fun. Most of the children at Bluebell will die before they reach adulthood. Observing, helping, chatting, and researching were an important part of my process while I was there. I enjoyed my time there very much, despite its being challenging. The life of each child looked like a fairy tale. At the beginning of the project, I was not very clear on what kind of ‘visual legacy’ I could create for the hospice. But each time I met with a family, I tried to understand more about their lives and how I could work with them. Each session was very productive and therapeutic for me. In the end, I have made 24 paintings in collaboration with the patients, and also a new fairy tale inspired by all the different people I met during the residency. AAA: As a performance artist, do you think that performance art, above other forms of visual art, has the greatest potential to connect with an audience? What are some of the key moments that are significant to you? DYM: Yes. I can give you some examples: In 2001, I did an interactive live performance entitled Clown, where I made up my face like a clown. I grinned stiffly at the audience and, with a contorted animal-like face, I laughed right into people’s faces, moving past them very slowly. The feeling conveyed in that situation was anything but funny. Then, in 2002, I did another interactive live performance, entitled Sleepwalker, where I woke up as if from a trance and slowly stood up. I then moved toward the audience as if I were sleepwalking. Suddenly, I slapped an audience member in the face. And then, I just moved on as if nothing had happened. AAA: You studied under Marina Abramovic. Can you tell us about your relationship with her and how she has inspired you? In my artistic life, I am very lucky because I have known her. She is a genuine person who brought me into the performance art arena. She has been very generous in her teaching. She always gives her students great encouragement to do performance art. During my studies, she often brought her students out of the walls of art school, and gave us opportunities to present our works in galleries, museums, and festivals in different countries. It was because of her that I got the chance to perform in different places between 2001 and 2005, such as the Irish Museum Of Modern Art in Dublin, the Venice Biennale and the Van Gogh Museum. 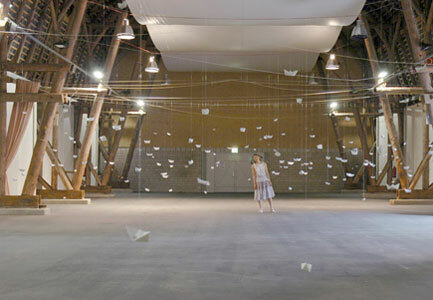 AAA: You are interested in researching the art system and its relationship to society. And you have done research in the UK in schools, museums, and galleries. How is this research coming along? What kind of projects will you develop in the near future from your research findings? DYM: For more than a year, I have been reading different cultural fairy tales as part of my research. And in the future, I would like develop new contemporary art fairy tales through performance; another important area of this research is to look at performance art in terms of therapy, like the Bluebell project, but with different performative methods. As of now, I have only finished part of my research in the UK. I am still carrying on my research in Germany and China. AAA: Beds, sleep, and sleepwalking have been recurring motifs in your work. I understand that you are also interested in dark desires. What are your darkest ideas as an artist, a woman, and a Chinese? DYM: Yes, bed and sleep have been recurring motifs in my work. I am a person who very much likes sleeping. Sleep brings me many of my creative ideas. I sleep a lot, I dream a lot, and I also work a lot. Dreaming is also a very important topic in my performance art works. Each person has a positive and negative side. I have always been interested in the negative side of people because the dark side is a very important part of our lives. As an artist my darkest idea is: I do not know what my future holds. As a woman, my darkest idea is about my age. As a Chinese, my darkest idea is: one day in the future, I will go to visit my parents, but they will already have died. AAA: You left China in the late 90s and are now based in Braunschweig. What was the major impetus for you to leave? DYM: On the one hand, I was not happy with my private life before I went to Germany. On the other hand, I had always dreamed of going abroad. When I was 17, I went to Technical University in the north of China, but to learn about art and go abroad were two dreams for me at the time. I have always had different dreams at different times in my life, and I have been lucky because most of my dreams have come true. Each person has his/her own best space for living, and I believe Germany is the best space for me to live and also to make art.